With their wild spending spree, are the Los Angeles Dodgers the NL favorites? 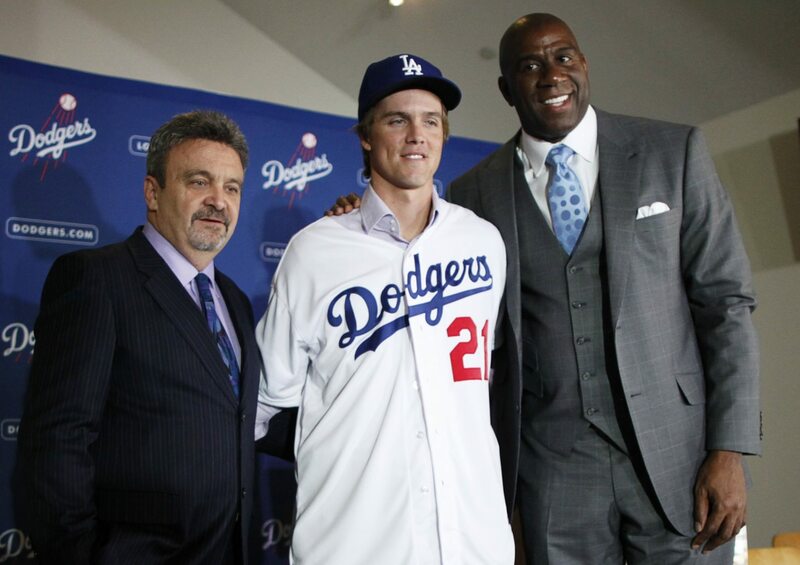 Since the Guggenheim Partners purchased the Los Angeles Dodgers for over $2 billion from the slimeball Frank McCourt this past spring, they have given GM Ned Colletti the green light to add salary and boy has he ever. Spurred on by new ownership and an enormous television contract from FOX Sports that appears to be on the way, the team has added almost $600 million under new ownership and thanks to the expensive acquisitions this offseason of pitchers Zach Greinke and Korean import Hyun-Jin Ryu, they will have a record $230 million payroll. But will all that green free flowing in Chavez Ravine lead to the team's first title since 1988? This must be some kind of bizarro free agency when you a team that is not the Yankees forking out huge money at the same time that the Yankees are actually showing financial restraint. But the Dodgers are clearly using the Yankees' playbook this offseason and even going into last season when they made that aggressive waiver wire deal with the Red Sox for Josh Beckett, Carl Crawford and Adrian Gonzalez. Can you truly buy world championships? I mean, the Yankees having three times as many titles as the second most club helps to strengthen that argument but since New York started getting really aggressive in free agency, after losing the 2001 World Series to the Diamondbacks, they only won once. It seems that the puzzle to a championship comes from building from within and making shrewd moves in the offseason through free agency and trades. But clearly, the Dodgers are not going through that playbook and when you look at the roster they have aggressively put together, it looks to be a real contender in the Senior Circuit. Let's start by looking at their pitching rotation, which was already the strength of the club this past season. You add Greinke, who has been a really good pitching for several seasons now, and the wild card of Ryu to a mix with Cy Young runner-up Clayton Kershaw, Beckett (who, before you laugh, pitched well when he return to the NL after the trade), Ted Lilly, Chad Billingsley, Aaron Harang and Chris Capuano. That's a deep, quality rotation and given how the Giants rode to another title on the backs of their own tremendous rotation, that's what you need to compete in the West. Figure that pitching with a lineup with Matt Kemp, full seasons of Adrian Gonzalez and Hanley Ramirez and a bunch of returners like Andre Ethier, this team is certainly in the mix for a pennant.